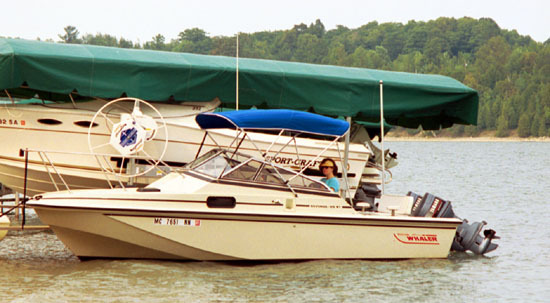 One of Michigan's nicest lakes, Lake Charlevoix is the perfect place for a Boston Whaler. 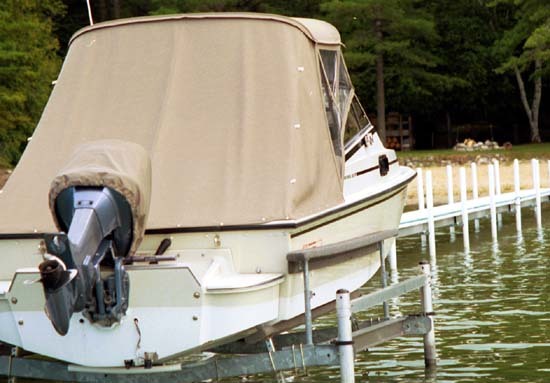 You can use it on the relatively protected inland lake, or take it out into Lake Michigan for some blue-water boating. 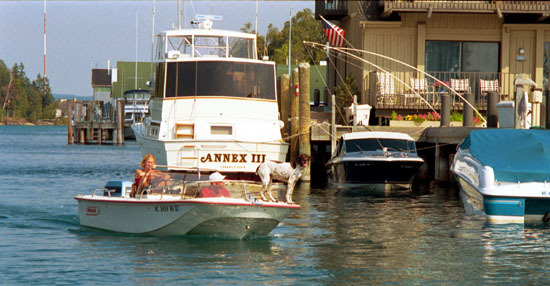 In August of 2000 we enjoyed a week on these waters and found our Whaler 20 Revenge was not alone. Here is a look at some of the other Whalers, both classics and new, and other interesting boats and locations that we saw up there. The docks, boathouses, and condos of Round Lake provide a nice background for this newer and larger Boston Whaler. Round Lake connects Lake Michigan to Lake Charlevoix and is only about a mile long. 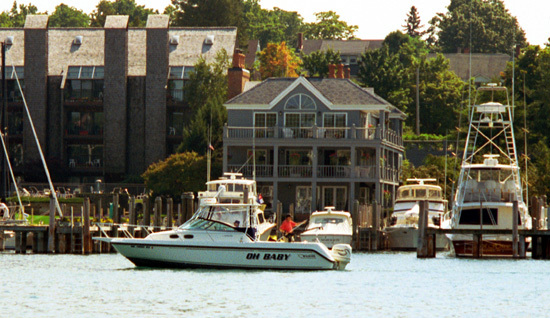 Every foot of shoreline--some of the most expensive lakefront property in Michigan--is filled with docks and boats. The red rub rail dates this Classic Whaler to 1975-1978 production. That bird-dog on the bow looks like it's in a hurry to make shore. More OMC power on the transom. This Classic Whaler is not a tugboat--it's a Frontier. Available on the 25-foot hull, the pilot house enclosure was a rare model. 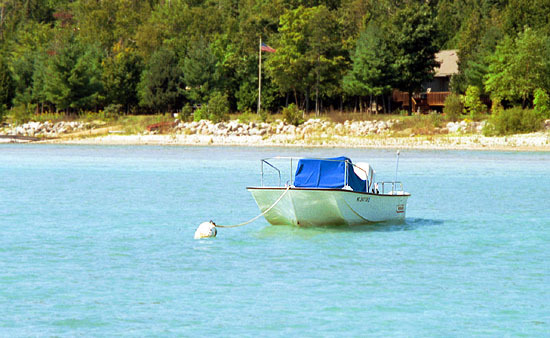 This one is moored on the west shore of the South Arm of Lake Charlevoix just south of Ironton. By the way, notice all the missing water. 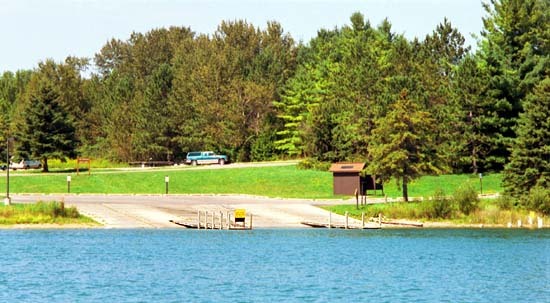 The lake levels were near record lows last summer. 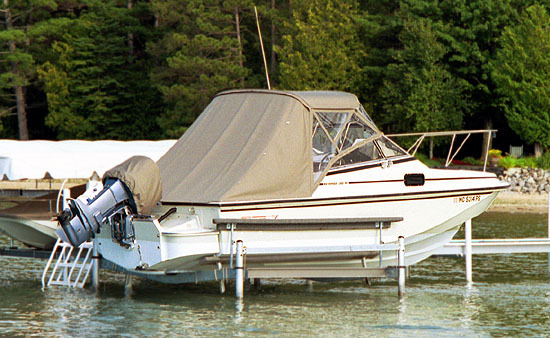 When you have a new boat, it is fun just to sit on it at the dock! My wife Chris gets a feel for our new Whaler. This view also shows how level the static trim is; no bow-Up tendency here. Thinking our 20-Revenge was going to be a rare bird, we promptly ran into this example of the breed. This boat has the Whaler Drive option, a stern appendage that extended the hull and provided a rather long setback for the outboard. There is no need for bottom paint when your Whaler spends most of its life on a hoist. I think that tan canvas has a classic look. And is that another classic Whaler in the hoist on the next dock, too? This 22-foot Outrage Cuddy with notched transom has a 150-HP Evinrude Ficht engine on a GILL Bracket. We found this Whaler on the South Arm of the lake. This old classic 16-foot Montauk spends most of the summer swinging on a mooring along the north shore of Lake Charlevoix. Development here has been truly amazing. Some recently built "cottages" are the size of 1880's Tourist Hotels and are owned by luminaries like Madonna. 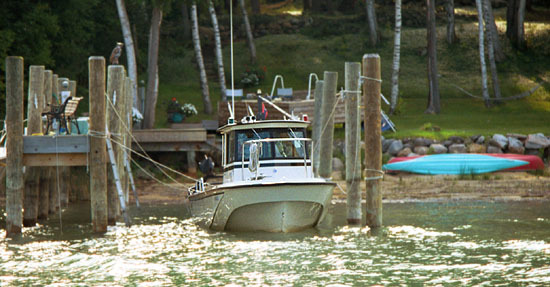 Your classic Whaler will be right at home with the other classics of American boat building seen on the lake, like this almost-identical pair of Chris-Craft yachts. The mahogany runabout is also probably a Chris. Like many launching sites in the state, Ironton provides excellent ramps, courtesy piers, and plenty of trailer parking. The beautiful blue, clear, fresh water is just north of The Narrows on the South Arm. If you see this ferry from this perspective out in the lake, you'd better look out. She sails at about 18 knots, making several round trips a day between Charlevoix and Beaver Island. 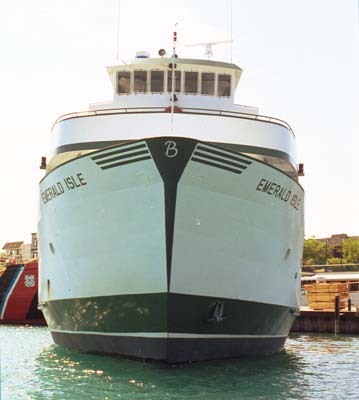 This ferry operates at "The Narrows", carrying automobile traffic across with a combination of diesel propulsion via propellor and cable guides. Everytime we came through it seemed like we had to wait for it to clear. The crossing only takes a minute or two.